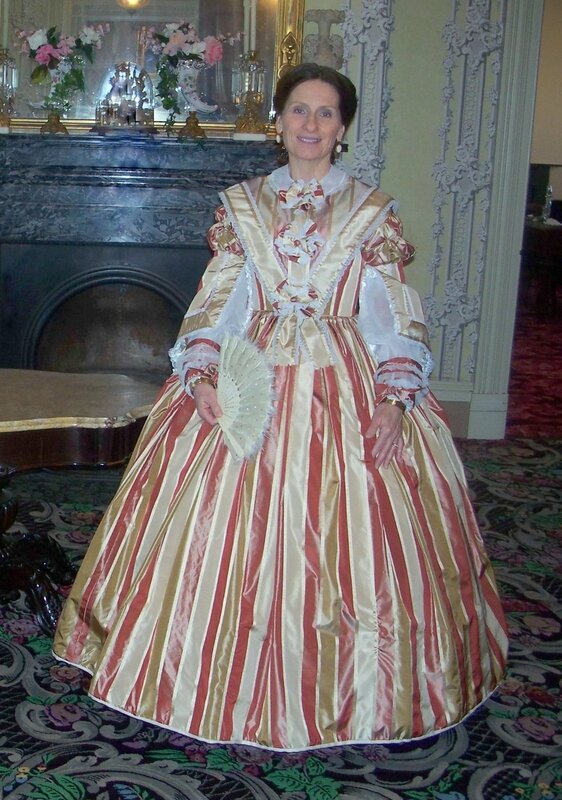 My mother just completed a new 1860s dress for herself and I wanted to share pictures with you. While fabric shopping together over Christmas break we discovered this lovely silk fabric that I fell in love with. I thought that it would make the perfect evening gown, but since silk is expensive, we decided that it should also have a day bodice. The finished dress has a pelerine and pair of pagoda sleeves that can be worn with it to make it appropriate for day wear, and for evening they can be removed. 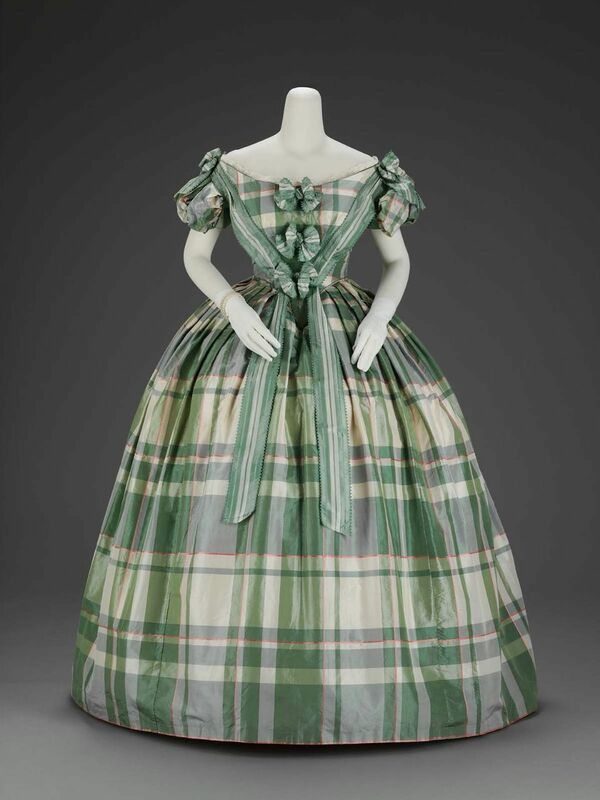 The dress is in the style of the late 1850s to early 1860s. The undersleeves are made of cotton net and are based off of an original set. I helped her with the design and she constructed it. 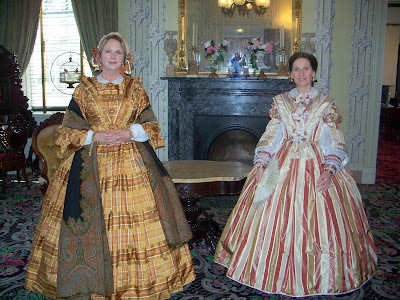 Here she is pictured with the lovely Glenda Jardel at Wheatland in Lancaster, PA.
Glenda's bonnet is made by the very talented Beverly Lister. 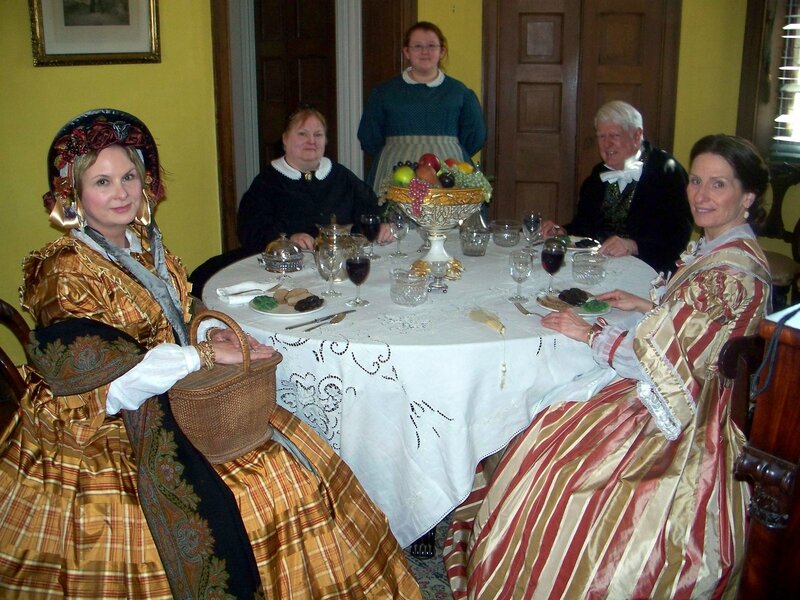 She is a wonderful bonnet maker with an eye for period detail. My mother's dress trim was inspired by these two stunning original dresses. 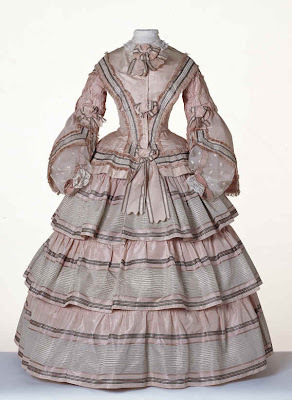 And her undersleeves were based off of this original pair. That is incredible! I love the undersleeves, too. I'm making some fancy ones now myself. I love the look with colored ribbons. So divine! It's so refreshing to see early 1860s dresses in light, bright colors. I love how well the bodice came together. Beautiful work! Beautiful! 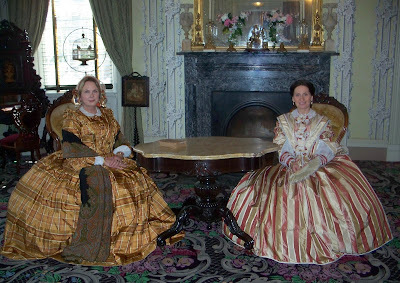 I couldn't attend the living history this month, but I am glad to see the pictures. Your mom looks great, as always! So pretty!! I love this bright, stripped silk material! Beautiful!! Thanks for all of the lovely comments! I really love how the cotton net undersleeves turned out. 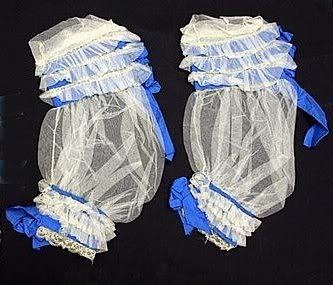 I'd love to make myself a pair of cotton net fancy undersleeves in the future. Do either of you teach or take on apprentices? Neither of us take apprentices or teach workshops at this time, although it's something that I hope to do in the future. I would recommend the Genteel Arts workshops taught by Carolann Schmitt: http://www.genteelarts.com/.